Tencent games confirmed today via an official trailer that their free to play MOBA Arena of Valor (known as Honor of Kings in China) will be officially launching on the Nintendo Switch this September. Features enhanced from the original mobile phone release for this Switch port include enhanced graphics, physical controls via the system’s Joy-Cons and the option to play a single world wide server. Having played the mobile version of Arena of Valor quite a bit, I’ve found the gameplay to translate fairly well from other MOBAs on PC, which arguably have much more fluid control options than on touch screens. Offering over 30 heroes, several of which are unlockable for free with minimum grind thanks to the ‘Road to Glory’ tutorial system, Arena of Valor does make a genuine effort to make AOV accessible for those of us who do not wish to put down any cash initially. Each hero has a unique set of abilities and passive traits, as you would expect – from ranged assassins that utilize physical weapons to dangerous spell casters capable of attacking multiple enemies from afar, a lot of different archetypes within the MOBA genre are present and accounted for. One other thing that has stuck out about AoV when compared to other games like Heroes of the Storm or League of Legends is the number of different modes on offer. Only have 5 minutes to play AoV before heading out? No problem there’s a 3v3 deathmatch mode for that! AoV does a good job of offering up a number of different modes that offering varying lengths and objective types. 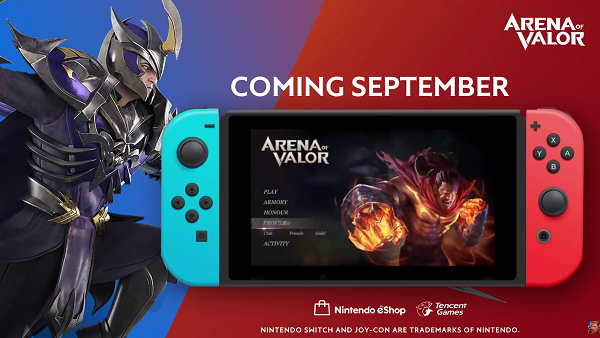 Arena of Valor will launch on Switch this September.